Subtropical rainforests can be found from the mountains to the coast in south-eastern Queensland and north-eastern New South Wales. Only small patches of once extensive forests remain at lower elevations but larger tracts still occur along the escarpment of the Great Dividing Range. The majority of these rainforests are now protected in National Parks and Nature Reserves and the most important have been afforded world heritage status. Many of the sounds of this album were recorded in areas around the author's home near Mullumbimby on the New South Wales north coast. Others were recorded in rainforests elsewhere in the region. The tracks evoke the changing moods of subtropical rainforests, progressing from the reverberating dawn chorus through the day with rushing streams, dripping foliage, thunderstorms and sudden downpours to the sounds of the evening and night. 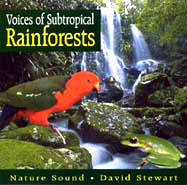 Each track features a series of calls of the bird, frog and mammal species that characterise rainforests of the region. Natural sequences of two well known bird songsters, endemic to the area, Albert's Lyrebird and the Rufous Scrub-bird, are presented as complete tracks. Other tracks have been compiled to contrast the local distribution of some species. For example the Sphagnum Frog, an inhabitant of mountain streams and soaks is included with the Little Shrike-thrush, most common in lowland forests and the Stuttering Frog, mainly confined to streams on elevated plateaus is included with the Black Bittern, seldom found far from the middle and lower reaches of coastal streams. Many species of rainforest birds, frogs and mammals are cryptic and difficult to observe and their calls are often the only indication of their presence. Learning calls can be an invaluable method for detecting cryptic species and it is hoped that these tracks may provide a stimulus for further investigation of the potential of this dimension. Track length indicates quick access to each independent track including National Parks (NP) and Nature Reserves (NR) where listed species may be found. that can be accessed via the Index number as well as each independent track.